Following her bestselling debut novel Come Away with Me, Karma Brown returns with an unforgettable story that explores the intricate dynamics between friends and mothers Hannah and Kate became friends in the fifth grade, when Hannah hit a boy for looking up Kate's skirt with a mirror. While they've been close as sisters ever since, Hannah can't help but feel envious of the Following her bestselling debut novel Come Away with Me, Karma Brown returns with an unforgettable story that explores the intricate dynamics between friends and mothers Hannah and Kate became friends in the fifth grade, when Hannah hit a boy for looking up Kate's skirt with a mirror. While they've been close as sisters ever since, Hannah can't help but feel envious of the little family Kate and her husband, David, have created—complete with two perfect little girls. She and Ben have been trying for years to have a baby, so when they receive the news that she will likely never get pregnant, Hannah's heartbreak is overwhelming. But just as they begin to tentatively explore the other options, it's Kate's turn to do the rescuing. Not only does she offer to be Hannah's surrogate, but Kate is willing to use her own eggs to do so. Full of renewed hope, excitement and gratitude, these two families embark on an incredible journey toward parenthood…until a devastating tragedy puts everything these women have worked toward at risk of falling apart. 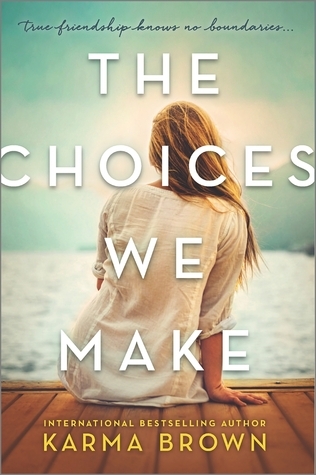 Poignant and refreshingly honest, The Choices We Make is a powerful tale of two mothers, one incredible friendship and the risks we take to make our dreams come true.